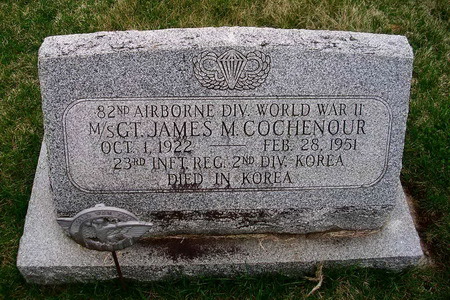 Grave markers for MSgt James M. Cochenour in Section 8. of the Forest Grove Cemetery in Plain City, Ohio. James was a member of Company I during WW-II and was discharged in Nov 1945 as a T/Sgt. 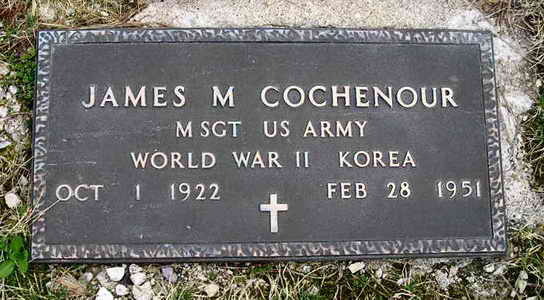 Cochenour remained in the Reserves and served in Korea with the 23rd Infantry Regiment, 2nd Division. He was captured on Nov 30, 1950 and sent to a POW Camp. He was killed while in captivity on Feb 28, 1951.